In cutting dovetail in barrel by hand, the slot is roughed out with hack saw cuts. 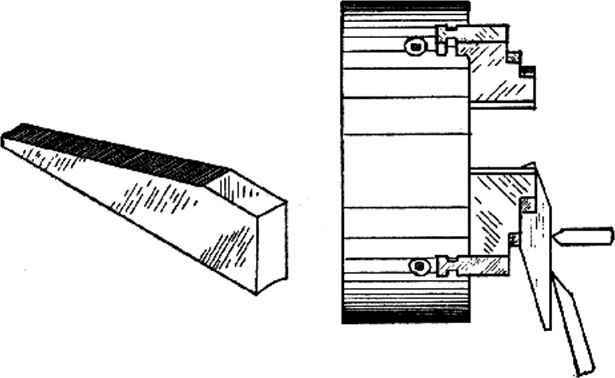 A small chisel is then used to chip away the metal between saw cuts as shown, after which the slot is finished to size with a tlirec-squarc file. red. 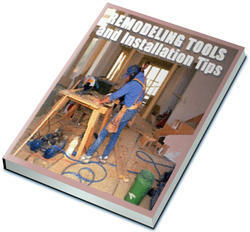 The material is turned at high speed and a very sharp tool is used to shape it. In the case of the regular beads, the shank should be about long. The shank is made a fairly close fit in the blade and Dupont cement is first put into the hole, the shank of the bead is then pressed in and the bead lightly clamped in place. A spring-type, wooden clothes-pin makes a good clamp for this job. A small parallel clamp is clamped to the opposite edge of the blade from the bead face, to give the clothes-pin a square surface to clamp against at that end. The regular Patridge:type front sight may be equipped with a colored bead of the Call-type, as mentioned above, or a square-type bead with a round shank can be made, the square being the size of the width of the blade. A shallow notch is filed on the rear face of the blade so that this square bead sets in flush. In cementing a new composition bead in a blade front sight, a parallel clamp is fastened on the blade below and opposite the bead. A spring clothes pin is then cut away as shown and used as a clamp while the cement sets. V32" slitting saw in a milling machine and then filed down on top to a height that will bring a bead sight to the proper height when its blade is filed down to the correct thickness and set into the sawed slot. A flush, tight-fitting pin is put through the sides of the original sight, pinning the bead sight in place. then cut down in height so that a standard bead sight with the blade cut to thickness is pinned in place in the slot. Gold-bead sights are made of phosphor-bronze wire, which may be obtained in various diameters. This should be brazed to a steel blade in making a regular bead-type sight, as solder does not hold it well enough. Solder, however, may be used to hold it in a hole in a steel blade, as the bead is protected better from hard knocks in this case. 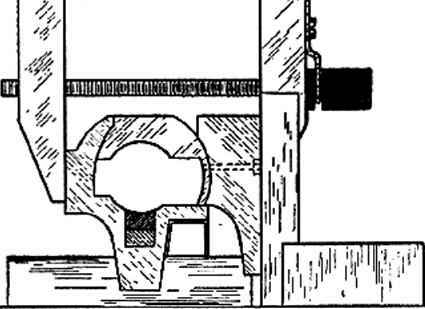 The Pat.ridge-type rear sight can be changed over to a U-notch, to work with a bead-type front sight, by taking a thin piece of steel and drilling a small hole in it the proper size for a U-notch, then countersinking this hole from the front side to give clear cut edges and filing the steel down to a straight horizontal line through the center of the hole, leaving a U-notch. The piece is then put in nitric-acid until it has a dull gray-black pitted surface, when it is washed in boiling water, dried and sweated with solder to the rear face of the Patridge sight. Left shows Patridge type rear sight changed over to U notch by soldering a thin piece of steel with U notch in it on the rear face of the sight. Right shows a square facc of red or white composition set into a Patridge type blade front sight of flat rear-face pattern. Receiver sights must be squared with the receiver, and the easiest way to do this is to set the action and barrel up on a surface plate. If you do not have a regular cast-iron surface plate long enough you can get a piece of heavy plate-glass from a glass company, as the surface of this is pretty true. Get a piece ten or twelve inches wide and about forty inches or more long. Lay this upon a true, flat surface, for glass is elastic and will bend if not well-supported. Set up necessary to square-up rifle barrel and action when fitting scope sight blocks. Set up of receiver and barrel supported on steel parallel and vee-block on glass plate, while side-plate for hunting-type telescope is squared on the side of the receiver with a machinist's square resting upon the glass plate. on the receiver with parallel clamps, using a machinist's square set on the surface plate to square-up the sight base on the receiver. tach sights, as they cut the alloy steels better and stand up longer without resharpening. A drill that just fits the screw holes through the sight base is used to spot these holes, just drilling the full depth of the drill point, so that the tap-drill used will center the hole perfectly. The base is left in place while tapping, so that it will act as a guide to start the tap straight. Shows base of receiver sight clamped in place on receiver for mounting. Receiver bottom rests on steel parallel upon heavy glass plate and the sight base is squared up with machinist's square setting on the glass plate. Even a high-speed steel drill will not drill a hardened receiver but as most all hardened receivers are case-hardened, it is only necessary to get through this case-hardening in order to drill the hole, as the center of the steel is soft. Various methods may be used to penetrate this hardened skin, one of which is to mark the locations of your holes, then remove the sight base and, using a small mounted grinding-wheel or carborundum point in a high-speed electric grinder, grind through the case-hardening at the two points you wish to drill the holes. The base is then replaced, squared-up and the hole drilling is done as on unhardened steel. How to spot enealle a hardened receiver?